Take a deep breath, gang, as we dive deep to get the lowdown on one of the ocean’s deadliest predators, in our great white shark facts! 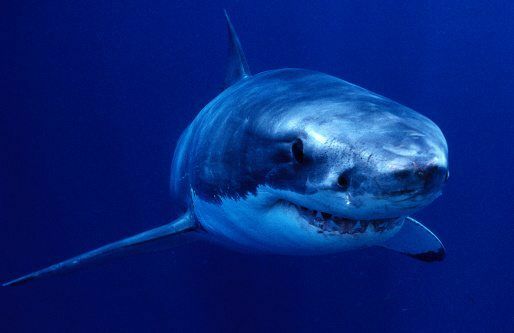 1) Great white sharks can be found throughout the world’s oceans, mostly in cool waters close to the coast. 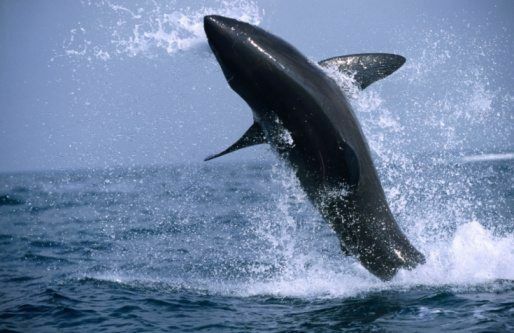 2) These super swimmers are the largest predatory fish (fish that eat other fish or animals) on our planet. On average, they grow to around 4.6m long, but some great whites have been measured at 6m – that’s half the length of a bus! 3) Great white sharks are grey with a white underbelly, from where they get their name. 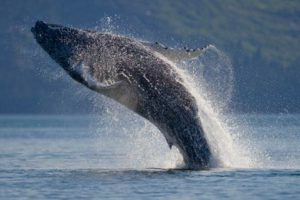 They have a streamlined shape and powerful tails that propel them through the water at over 60km per hour! 5) Whilst many think of these beasts as fearsome man-eaters, humans aren’t, in fact, on the great white’s menu. Phew! 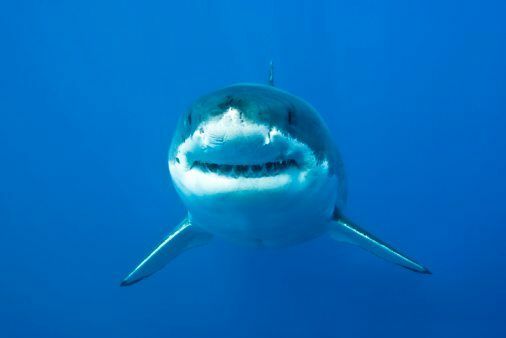 There are around 5-10 attacks a year, but researchers believe that, rather than preying on humans to eat them, the sharks are instead taking a “sample bite” out of curiosity, before swimming off. 6) So what do they eat? Well, when they’re young, they feed on small prey, such as fish and rays. But when they’re older and bigger, they generally feast on sea mammals such as sea lions, seals and small whales. 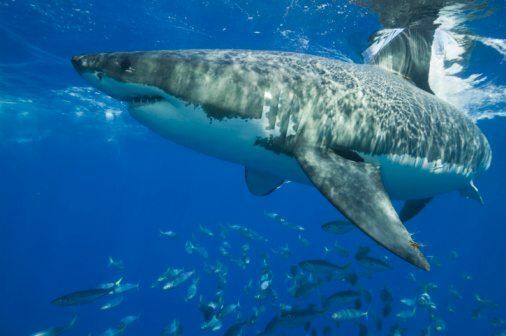 7) Great white sharks have such a strong sense of smell that they can detect a colony of seals two miles away. 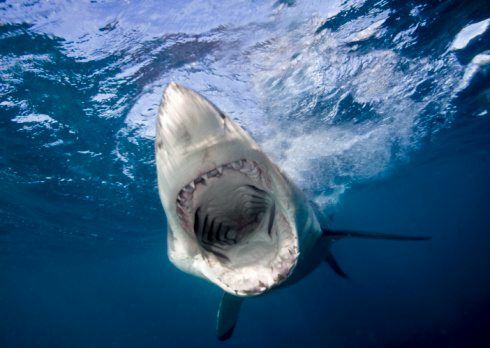 And check this out – if there was only one drop of blood in 100 litres of water, a great white would smell it! 8) These cunning creatures like to take their prey by surprise. They usually position themselves underneath their unsuspecting victims before swimming up and…chomp! They often burst out of the water in a leap (called a breach) before falling back in with their meal in their mouths. 9) When a great white gives birth, she usually has two to ten youngsters, called “pups“. But she shows no care for her offspring – in fact, she may even try to eat them! Taking care of themselves, the newborn pups will immediately swim off into the ocean. 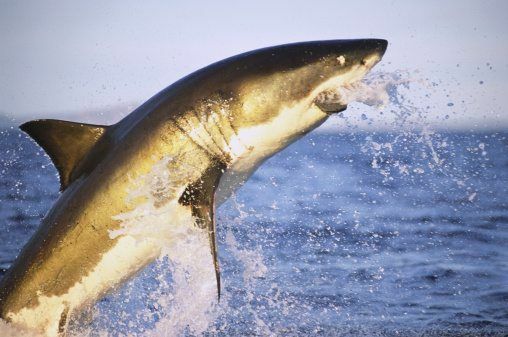 10) Great white sharks are at the top of the food chain and aren’t likely to be killed by other sea creatures. Sadly, however, they are under serious threat by human activity. Illegal hunting of these beautiful beasts, and overfishing, have meant that today great white sharks are a vulnerable species on the IUCN Red List. Fancy putting your shark knowledge to the test? Then sink your teeth into our super shark quiz! 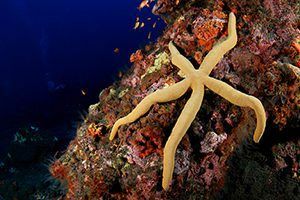 Love reading about magnificent marine life? 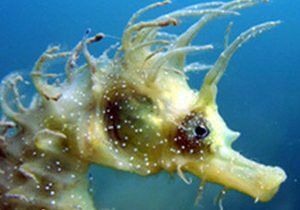 Then be sure to check out our ocean’s weirdest creatures and 10 facts about bottlenose dolphins! What did you make of our great white shark facts? Let us know by leaving us a comment, below! I'm so amazed and fascinated by these wonderful majestic marine life! Wow this is cool! I didn't know these! Very interesting notes Im writing a paper and yalls facts really helped me and now Im really interested in great white sharks! I LOVE GREAT WHITE SHARKS!!! Thanks for sharing this for me!!! It helped me to do my On-Demand!!! THANK YOU!!! This is AWESOME!!! This helped me in my On-Demand!!! Thank You!!! I am exited for new blog!!! Can a great white sense emotion from humans, AKA Emotional intelligence? I am sorry for puting three comments,I didnt mean to. Everyone else on this "commenting" I am sorry for puting two of one comment, I didnt mean to. Nice! Thanks for the info. Used it for school! THATS SO COOL!I WISH I WAS A GREAT WHITE SHARK! Great White Sharks are epic awesome and my favourite animal and to any shark cullers out there, we are invading their ocean and do not kill SHARKS!! 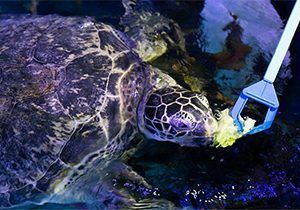 Love great white and all sharks can you do a video about turtle tho? Sharks are incredible! They are some of my fave animals (after squids). Unfortunately, like so many incredible things, they are endangered by humans who use their fins in shark fin soup. I think this should be stopped! I love animals! Sharks are one of my favourites. I love how they change teeth so often! This was very interesting. Youre ten times likely to be struck by lightening then to be attacked by a Great White Shark. #ILOVESHARKS!!! This helped me so much with my homework thanks so much. I will use your blog every time from now onwards. Did you know that 100 million sharks are killed each year? 100 million. This is mostly due to overfishing and finning, to cater for very high demand of an Asian delicacy, called Shark Fin Soup. Cool facts about Great Whites! wow it was so interesting! my favorite animal in the sea is the great white shark. they are the best animal in the world to me. I love learning about sharks because it is for my school homework. Sharks are really Scary!!! AHH!! sick! I love sharks, especially great whites! im a scuba diver in training any tips would be great thanks guys!!!! If great white sharks need help then we should help them. If there is a way then we should try it. Remembering also to have a plan B.